Renal infarction is a rare occurrence, but one that often generates a number of clinical questions. When encountering a patient with renal infarction, an investigation into the potential etiology typically takes place, with consideration given to cardiogenic embolic sources, hypercoagulability, or vascular abnormalities. Management strategy is also considered, both with regard to acute treatment with thrombolytics or intravenous heparin, and long-term need for anticoagulation with warfarin, aspirin, or other agents. Consideration also needs to be given to long-term clinical outcomes of patients suffering from renal infarction. While most patients have preserved kidney function, some suffer from acute kidney injury and a few develop ESRD. 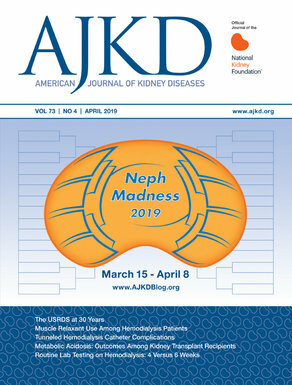 A recent article by Oh et al offers the largest number to date of reported cases of renal infarction, and attempts to elucidate cause, management strategy, and outcomes. They gathered retrospective data from 438 patients at 9 hospitals in Korea with renal infarction diagnosed by imaging studies over a 20 year period. In keeping with prior reports, they categorized the etiology as cardiogenic, renal artery injury, hypercoagulability, and idiopathic. The most common cause of infarction was cardiogenic, occurring in 55.7% of the cases, and frequently associated with atrial fibrillation. The second most common finding was no predisposing factor identified (30.1%). Hypercoagulability was noted in 6.6% of cases, and renal artery injury (commonly dissection) was noted in 7.5% of cases. With regard to management strategy, a relatively small number of patients underwent thrombolysis (19 out of 438 patients) while a majority of patients were treated with heparin (81%) and warfarin (78.2%). The majority of patients with hypercoagulability, cardiogenic, or idiopathic renal infarction received anticoagulation, while relatively few of the patients with renal artery injury were treated this way. Finally, with regard to clinical outcomes, 5% of patients died during the hospitalization at which renal infarction was identified. 20% developed acute kidney injury, 10.9% incident CKD with an eGFR < 60 mL/min, and 2.1% ESRD. Given the infrequent occurrence of renal infarction, it seems unlikely that there will ever be a randomized control trial of treatment strategies and outcomes data. This collection provides valuable information with regard to cause and long-term outcomes, which can help guide an investigative strategy and better prepare patients and physicians for possible the short- and long-term outcomes of renal infarction. It would be difficult to adopt a comprehensive treatment strategy based on these and other reported data. Nevertheless, is it useful to see that the majority of patients with renal infarction are treated with anticoagulation, particularly in the cardiogenic and hypercoagulable categories.